Happy July from all of us at edX! We’re hard at work improving the experience for course authors and learners, and are excited to share the features we’ve been working on with you. Many of our learners want to pursue a full masters after they complete an edX program. 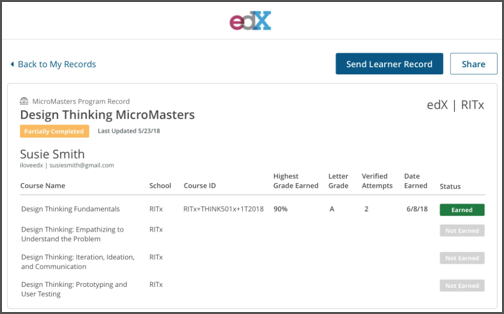 To help learners who want to apply their MicroMasters credential as transfer credit, we’re building a transferable student record that will enable students to share their edX record with partner institutions. We look forward to seeing our learners continue their education! Version 2.15 of the edX mobile apps for iOS and Android is on the way! This latest edition will help learners find courses in subjects they’ve expressed interest in and includes rotation and landscape support for tablets. There’s so much to remember when you launch a course—and we’re making it easier for you. 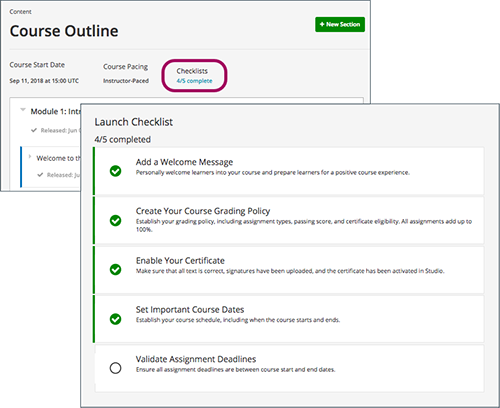 With the Course Launch Checklist feature, Studio automatically keeps track of important course launch steps and updates the list as you update your course. The status of the checklist items is visible right on the Course Outline page, so you always know how many tasks remain. Looking for all the learner data for a specific problem? Thanks to the Open edX community, you can soon download the Student State report for single problems or for all problems in a unit, subsection, or section as well as for all problems in the course. We just want to remind course authors that we’ve updated the requirements for user passwords so that they have to be more complex. Don’t forget to update your password by July 18! We’ve been adding important information and tips to our documentation as we add features and course teams discover best practices. Recently, we’ve specified that course teams can grant exceptions for learners who need more time to take exams and added step-by-step instructions for creating problems that use XQueue and an external grader. For more information, see the following topics in Building and Running an Open edX Course. On the edX Partner Portal, help is always close by. On the home page, you can select Get Technical Support to open the EdX Partner Support page. There, you can access technical support, submit a support ticket, or review any support tickets you have created.